There’s very little I miss about Page, Arizona, but the landscape is one. Well, the only. I still get nostalgic when I stumble across it. 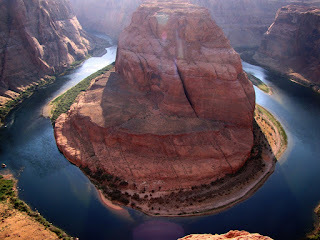 And then Garry at Geotripper has to go and publish a post on the Horseshoe Bend. Horseshoe Bend by Garry Hayes. Used with Permission. This is one of those places the locals, geologists and photographers know well, and strangers almost never see. And it’s one of the places I took John from New Zealand to. I’ve mentioned John before, in connection to kittens named Jesus. I thought I’d told the story of how we met, but I can’t find it. So I’ll bloody well tell it again. If you’ve heard it, just head over to Garry’s place now. That was Dave. We gave him endless crap over his Boston accent and loved him immensely. But when you’re writing, you try to ignore distractions like Dave. “John here wants to see the Horseshoe Bend,” he said cheerfully. He went on to introduce John, who was from New Zealand, as I went through several calculations, among which was the likelihood I could trust Dave’s friends. John, in fact, was dressed as a serial killer. He was wearing perfectly ordinary clothing. Rather nice clothing, by Page standards. And he looked nice. Ordinary. Just like serial killers. Horseshoe Bend is in the middle of nowhere, for all intents and purposes. It’s not that far outside of town, but it’s not exactly a heavily-frequented spot, and it’s a drive down a dirt – well, sand – road, and then a long walk over sand to get there. You could be hours without seeing a soul. Still. I was in the midst of reclaiming my ability to trust people after having been raped, and this seemed like a good opportunity to work on that. Take a perfect stranger out to the middle of nowhere, in my car, and walk further into the middle of nowhere with him, with no one but Dave knowing where we were, all in order to build confidence again. Genius. I wasn’t terribly worried, actually. If John got dangerous, I figured, there was a convenient 1,000 drop to tip him over. No problemo. So I stuffed John in the car, and off we went to Horseshoe Bend. On the way, John told me he was a PhD student in anthropology, seeing America before headed off to the wilds of South America. He had a lovely accent, and was appropriately awed by the desert landscape, and I began to quite like him. And I’d been wanting to see Horseshoe Bend again anyway. As far as entrenched meanders go, this one’s world class. Photographers scream in delight when the light hits it just so. And the look on John’s face when we reached it made the slight risk of sightseeing with a serial killer worth it. So worth it. He looked down, and down, and down, and made the kinds of noises people make when they’re staring at a river a thousand feet below, winding through the desert around a pillar of sandstone. I made the noises locals make when they’re proudly showing off the local attractions. And then we stood in silence for a bit, as the sun and shadows picked out all of the textures left by millions of years of uplift and erosion of lithified red dunes. We ended up going out to Chin Lee afterward, on the Navajo reservation, through a lot of nowhere, so I could show him the traditional weavers, and we went over Glen Canyon Dam, and ate the local Mexican food (which horrified him, because he knew what the real stuff should taste like). I brought him home for fajitas that night, and he told me and my friend Janhavi the story of Jesus, and I’ll tell you something: it was one of the best days of my young life. I’ll never forget John. I’ll always be fond of Dave, even after being so clueless as to volunteer me to drive a perfect stranger around. And I will always adore Horseshoe Bend for having the cliffs that gave me the courage to risk it. First, the photo you have up is stunning, but the lead-up at Garry’s blog is wonderful. Recollections of the Qu’Appelle Valley in south Saskatchewan (flat-flat surroundings, with sudden river valley). But way more impressive. WAY.